Last weekend we celebrated Naomi's fifth birthday at a children's play place called Barilochicos (which literally means Bariloche Kids). As the kids came in I greeted each child with a kiss while Naomi unceremoniously ripped open the gift... as you can see in this picture. When I mentioned to a mother that in the United States gift opening is a big ordeal done all at once with a careful list of gifts and who gave them, she stared at me in shock. 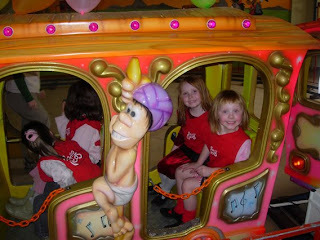 Here you can see Naomi and Phoebe sharing a ride on the train. 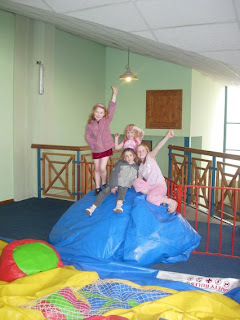 This is the girls with a friend at the end of the party. 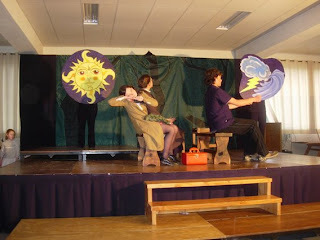 All in all it went quite well, except that the next day I awoke with a miserable sore throat and a horrible head ache. 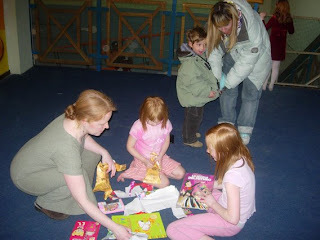 As Jocelyn (Chloe's teacher from Australia) said later on "All those little ones can be a bit germy!" I guess I shouldn't have kissed them all, but I think I was supposed to. After the party I had only two days to finish everything for the play. I painted a portrait for the hallway of the mansion. I repaired all the puppets that have been damaged from rehearsal and transport. I sewed the backdrop and drew a flower border for the program. By Thursday morning I'd lost my voice and felt awful. That night we went to the big production. It was a charming performance. 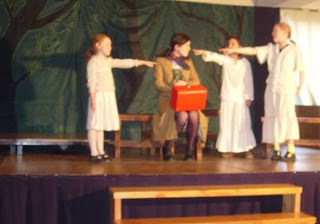 Chloe and Phoebe are two of three kids in the play and they did great. 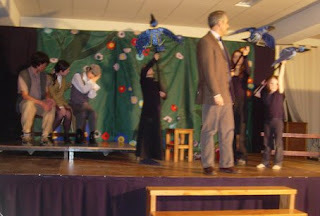 There was a director of a bilingual school in the audience, and she has asked the cast to perform it again in two weeks on their stage. The kids are really excited. This is a lousy picture of the girls onstage. 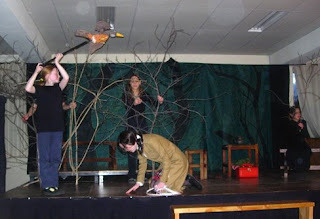 Here is Chloe puppeteering Robin. This is a scene where they are driving to the mansion. A slightly fuzzy picture of Mr. Cravin and the blue jays. 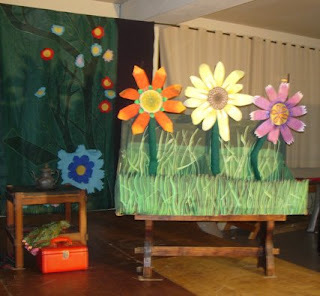 And here's a shot of the flower garden onstage. On Saturday it rained all day, by Sunday it turned into drippy, wet flakes of snow, and here it is Monday afternoon. Schools have been cancelled and the snow is still coming down hard. The gray clouds block out all the mountains that surround the city. For all the snow we've had, I have yet to see a single plow, and only a few stores have bothered to sprinkle out sawdust on the sidewalk. 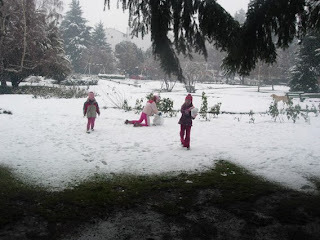 The kids felt cooped up so we took them to the park. 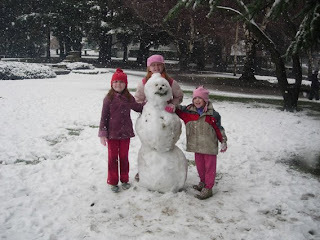 This is their snowman, christened "Hermes" by Naomi. (We bought Chloe season three of "Futurama" for her birthday, so of course they gave their snowman a brain slug). Happy Birthday to Naomi. I am sorry you got sick but I love the pictures.